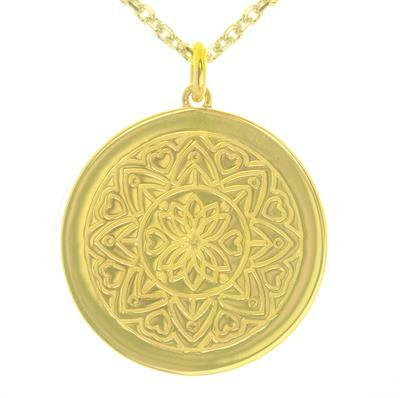 A beautiful Yellow Gold-Plated Sterling Silver large disc pendant, with a mandala image cast onto the front, the disc is left blank on the reverse for your engraving. Choose a mantra that is personal and powerful to you - a quote you love, or words you wrote yourself. Catch sight of your inspiring phrase in the middle of a busy day or at a frustrating moment to lift your mood and focus your attention on the present. The mandala is a symbol of the wholeness of the universe. Symmetrical and circular, with orderly shapes and patterns, a mandala symbolises harmony and unity, and represents your connection to the universe. A mandala can be seen as a spiritual tool, or a beautiful piece of art. The mandala we have created for Mantra weaves hearts around a central lotus symbol, showing the love that connects us all. The 'Love Mandala' necklace is designed to bring comfort to the wearer, reminding you of the love that surrounds you, and your close connection with the universe. 'myMantra' is your way to carry your personal mantra with you every day, or gift someone special with their very own moment of motivation. This pendant hangs from an 80cm Gold-plated, Sterling Silver chain, designed to hang close to your heart. This pendant comes with a personalised myMantra card featuring your chosen mantra. If you are buying this for a gift and are not completely sure of your engraving we can send you a blank disc which can be engraved at a later date. We can create your card including the mantra you think they'd love, leaving the final decision down to the recipient.